"Any interpretation is legitimate," Christo, 80, allowed graciously. He spoke in an interview with The Associated Press at the picturesque Lake Iseo. It is in northern Italy, where his 23rd large-scale installation is about to open. Since November, Christo and his team have been overseeing the assembly and anchoring of 220,000 floating polyethylene cubes to create a nearly 2-mile undulating runway connecting the mainland with a pair of islands, one inhabited and towering above the lake. Once the installation opens on June 18, 150 volunteers, among them lifeguards, will be posted on the piers and on boats to ensure safety. Swimming is forbidden, but expected, despite the cold water temperatures. Entrance is free. The entire cost of the $17 million project was financed by the artist himself. 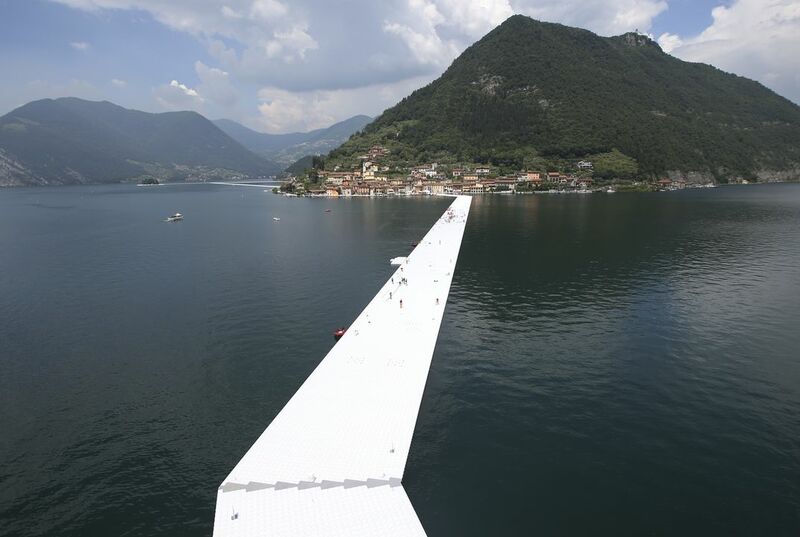 Christo's projects are as much feats of engineering as they are works of art. He has brought in a team of athletes from his native Bulgaria to assemble the specially made, recently invented cubes. Divers anchor them to concrete slabs on the lake-floor, employing oil-rig-inspired two-week rotations. The 190 anchors were moved into place by air balloons. Amazing on how to make a giant bridge over the river :O. Still though... it would feel nice because the breeze of the lake will be a amazing feeling. The installation might bring back a good memory of any kind. That happens to me too. Even in the weirdest things possible. Walking over the water feeling might be good. I think i would be bettered if the ground was reinforced glass. I'm saying my opinion. In response to "Now you can feel what it's like to walk on water," I disagree that you can now feel what it's like to walk on water. One reason I disagree is that you are walking on cubes not water. Another reason is that you would fall into the water if you were walking on it. If you were running extremely fast you could possibly run across water. 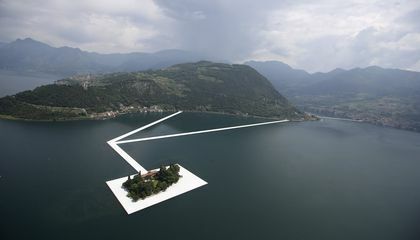 It says in the article "Since November, Christo and his team have been overseeing the assembly and anchoring of 220,000 floating polyethylene cubes to create a nearly 2-mile undulating runway connecting the mainland with a pair of islands, one inhabited and towering above the lake." A third reason is that if you were feeling what it was like to walk on water you would be wet. Even though it might feel a little bit like walking on water, I think it does not have the complete feeling of walking on water. What a fantastic idea. I am sure many people would love to experience this bridge only one would dream of. I am going to have to go there some day and see it for myself! I think this is a great idea because it really is like your walking on water and it's such a great experience for many people. Many people would like to enjoy to kinda walk on walk on water. It is a unique architect.